Line a 20-25cm loose-bottomed flan tin with greaseproof paper. Roll the pastry out onto a well floured board to fit in the flan tin. Press the rolled pastry into the tin and prick with a fork. Bake for 20-minutes or as recommended on the packaging. Leave to cool. Meanwhile, steadily mix JUST MILK into the corn flour on a reduced heat, stirring continually for 5-10 minutes until it thickens. Cook for a further two-minutes then remove from the heat. Break up the chocolate and add it with the almond to the corn flour mix, stirring until it is all melted. Stir in the icing sugar and the pear liqueur. Quarter the pears & place them in the dish. 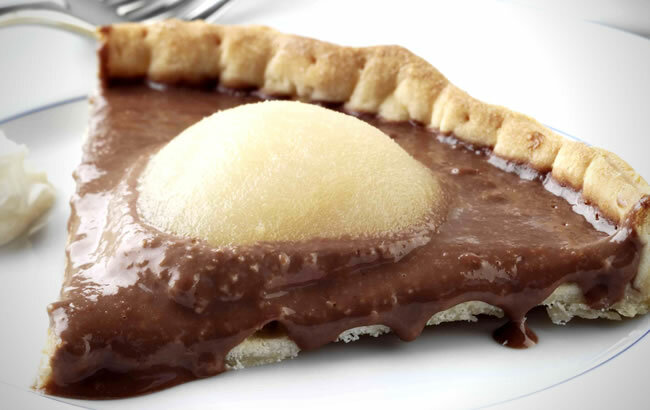 Spoon the chocolate sauce over the pears and allow to cool entirely. To be served with creme fraiche (sour cream).